Playing the same games time after time can be exhausting if not boring, to say the least. Can you imagine an online casino where the games would be like nothing else you have already experienced before? A different environment packed with the same beloved rules. What if we told you something like that actually exists? There is a site called Bitkong and if you haven’t guessed yet, Bitcoin is accepted there. Today we will take a look at all of this unique casino’s features. Make sure to read the whole Bitkong review so you don’t miss a thing and let us assure you from now that it will be absolutely worth your time. Visit the website and you will see that there is only a single game offered. This game doesn’t require anything but luck as the only thing you will have to do in order to play is to select the amount you want to bet and then you are good to go. You don’t even have to create an account as you can register and log in using nothing else but your Facebook account. The site launched in 2017 so it’s still too early to know whether there will more games available in the future or not. As previously mentioned there is only one game available on the site. Their motto is “Fun and addictive, provably fair Bitcoin game”. You can try it for free and we want to let you know that it is both extremely fun and addictive. There are three difficulties. Each difficulty yields different rewards, the easier one is the lowest paying. The minimum bet is 1bit which is 0.000001BTC which at the time of this writing is equal to a bit more than one cent. So let’s take a look at said difficulties. The logo of this one is a coconut. It is made up of a three column and ten row table. Make your bet and start playing. You can pick one out of the three hidden rewards. In fact, two of those choices are the rewards (a multiplier of your money) and the remaining one is the losing option. If you succeed and pick one of the winning ones then you have the option to either stop and take your winnings or to continue on the next round for the chance to get an even bigger multiplier. If you lose then you lose the money you bet. Simple as that. 66% chances of winning may sound like a lot but the furthest we got was the fifth row. Each time you win you get a 50% profit compared to the amount of the previous row. Now imagine what would happen in the bigger difficulties. The logo is a couple of bananas. You get the same table of ten rows as before but this time there are only two columns thus two choices in each round instead of three. Your chances may decrease from 66% to a 50% but the multiplier of your bet is accordingly bigger as well. We gave it a single try and made it all the way to the 8th row and lost at the 9th. Each time you win you get a 100% profit compared to the amount of the previous row. With an initial bet of 0.1$ US, we could have hypothetically win 20$ which is a 200 times multiplier. We know we were pretty lucky but we actually did use a simple tactic. We would stick to one column for two rounds and switch on the third. Probably a coincidence but the chances of getting 3 successful options in one column are very low so if you want to give it a go we recommend you use this easy yet effective tactic. The third and last difficulty has a pineapple as a logo. The layout is the exact same as the one you will encounter in the “easy” difficulty. However, this time instead of having two right choices and one wrong the exact opposite applies. Two of the choices will make you lose while only one will make you win thus you only have a 33% chance of winning in each round. Each time you win you get a 200% profit compared to the amount of the previous row. With chances like this we probably won less than 5-6 times in the 15 times or so we tried. You can see that the site is absolutely fair to play on and the random number generator of the game is taken from Bitcoin’s Blockchain. There is even a “verification” option you can turn on and see the current rounds hash address. BitKong isn’t big on bonuses towards new players so if you aren’t ready to gamble with a lot of money then don’t expect any offers to come your way. Instead of the usual bonus only the 10 top players of the day, week, and month get one. The ranking is based on the amount you have wagered during a said period. Every day the top winner in the number one position gets 30,000 bits which are 0.03BTC that, at the time of this writing is equivalent to about 330$ US. 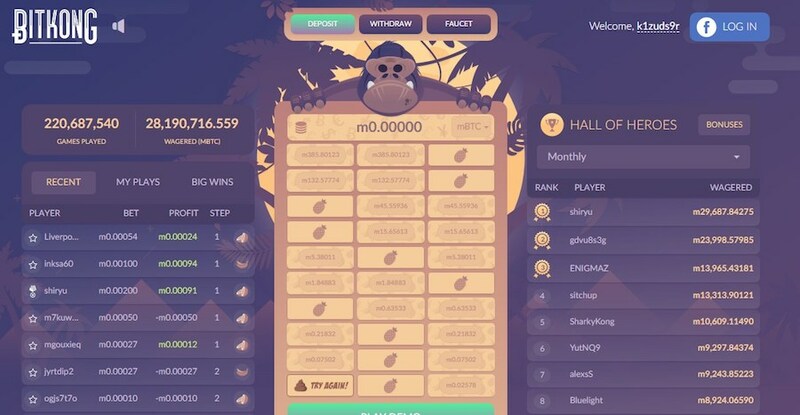 Every week the top player gets 150,000 bits which are equal to 1650$ and every first of the month the best player gets 500,000 bits which are equal to 5,500$. This is some serious money people. Bitkong makes sure to reward its most loyal players by giving them those extreme bonuses. You should also be aware of a specific section’s existence which is called the “faucet”. For a specific number of minutes that pass you will get a relatively small amount to start gambling with. This has no cap. As long as you play so will those small bonuses keep appearing in the faucet. However, you can’t have more than 50 available claims at a time. There is an affiliate program offered as well! So how does banking work on this amazing site? It is actually fairly simple of a process. There are two buttons. The deposit and the withdraw. We were very happy to see that you can actually deposit in a variety of currencies. Those include your usual Bitcoin denominations such as the millibitcoin (mBTC), bits, and the Satoshi (sat). You can also deposit in USD, EUR, GBP, Brazilian Real (BRL), Indian Rupee (INR), Russian Ruble (RUB), AUD, CAD, Japanese Yen (JPY) and various other ones. If you deposit less than 2mBTC then a fee of 0.2mBTC will be deducted. Select the one you want, the desired amount to deposit and then you can either pay by scanning the QR code appearing on the screen or by using the provided address. 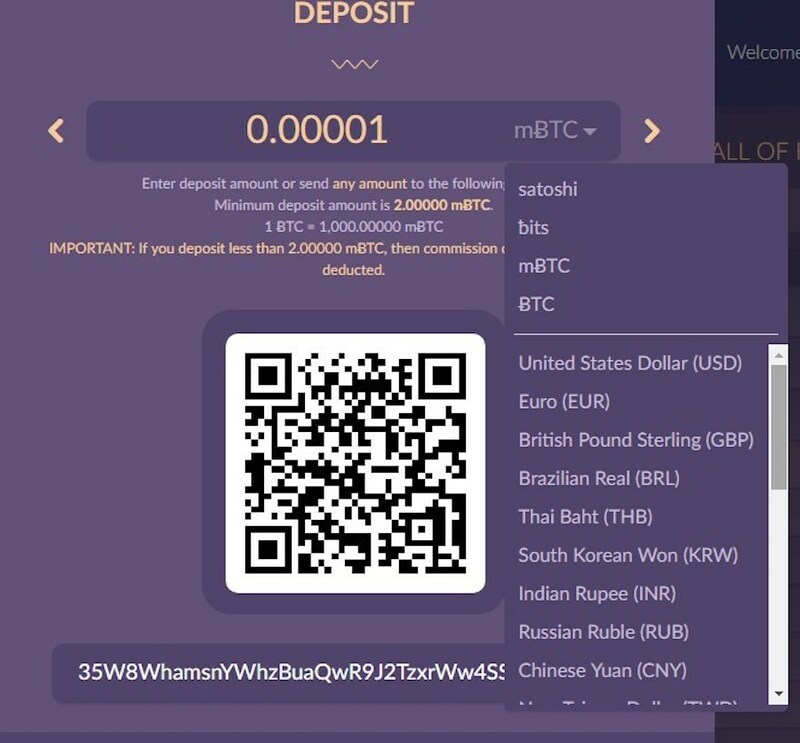 Withdrawing is even simpler. You just select the amount you want to withdraw and the address you want the money to go. The minimum withdraw is 2mBTC and there will always be a 0.2mBTC prefixed processing fee no matter how big or small the amount you want to withdraw actually is. If you have a problem then you can take a look at some of the FAQs as soon as you click on their “Support” page. If you don’t find the answer you were looking for then you are welcome to send them a message through the chat option. Although, you would probably have to wait a couple of hours before getting a response. If you want to ask them something, in general, you could message them through their Facebook or Twitter page as well as open a thread in the Bitcointalk forums. Who is This Casino Good for? It is a place where you can play a fun and simple gambling game. So we would probably recommend it to everyone who either wants to relax while having some fun or likes to earn some extra money on the side. When it comes to the selection of games you can’t judge a casino offering a single one if they do it excellently. 5/5 for that. The bonuses are mostly in favor of the high-rollers but it is a good thing that at least there are some free coins for beginners to start with. 4/5 on this section. Now, when it comes to the support things could definitely be better. Although, only one game is offered and it is pretty simple. The banking system is laid out perfectly so we can’t really see a reason for more people in the staff or more contacting options. 4/5 just for the lack of a telephone number. Banking is exceptional as there are countless available currencies accepted by the site. 5/5 on this section. Last but certainly not least is the mobile version. We didn’t mention that previously but there is a dedicated Android app you could download. On top of that, the site is customized for mobile use so they get 5/5 for that as well. As a result, Bitkong’s overall rating is 4.6/5! A simple and fun but yet addictive Bitcoin gambling experience for both newcomers and professional players looking to enjoy their selves or just make some extra cash. We hope you found or Bitkong review both useful and informative. Now go out there and check BitKong on your own. We are sure you are going to love it.